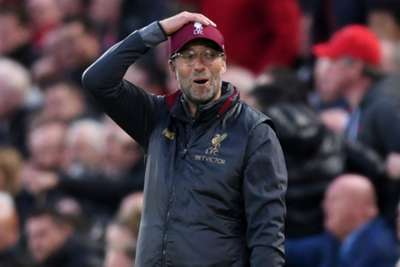 Jurgen Klopp believes outlining his own high standards in public might be responsible for expectations that Liverpool have more gears to move through. The Reds are back in Champions League action against Red Star Belgrade on Wednesday after losing their previous Group C match 1-0 at Napoli. Liverpool are yet to experience defeat in the Premier League this season over the course of nine matches and sit level on 23 points with leaders Manchester City in England's top flight. Nevertheless, Klopp remarked he was winning "average matches" for the first time in his career following Sunday's workmanlike 1-0 victory at Huddersfield Town. Ahead of another night of anticipated Champions League fireworks at Anfield, the former Borussia Dortmund boss conceded he has helped to fuel a clamour for improvement. "I understand that," he told a news conference. "Maybe it's because of one or two post-match interviews of mine. "But our first job is to win football games. We've played some really good football. We compare with the best games from last season. Nobody remembers the average games. "All the games we won so far we deserved to win. In the two draws we had in the Premier League we deserved a point, the game at Napoli we deserved to lose. "The basis we created is a really good one, football and point-wise and now we have to build on that every day, week in week out." Group outsiders Red Star head in to the match, where Liverpool will be without injured midfield duo Jordan Henderson and Naby Keita, on the back of a 6-1 hammering at Paris Saint-Germain. Despite that heavy reverse, Klopp has been impressed by the robust approach that earned Vladan Milojevic's side a goalless draw in their opener against Napoli. "For Red Star the challenge is a little bit that they are that dominant in Serbia, winning 80 or 90 per cent of their games," he said. "The Champions League is then different, against the top teams in Europe. It makes it difficult. “But I really think they did well. They defended well against Napoli, they did everything well. And against Paris, if they open Pandora's Box, then it's different. If Neymar scores from 30 yards with a free-kick nobody can defend that." There will be no travelling fans on Merseyside as a result of UEFA sanctions against Red Star following a pitch invasion in the aftermath of their dramatic play-off win over Red Bull Salzburg. "When I was a player I played in empty stadiums. The fans were not banned, they were just not interested in the football," Klopp joked. "A stadium full of only one crowd, I never experienced. Of course, it's not nice for the people of Belgrade but we have no influence on that. "We would have had no problem if their fans had been here, we'd still have had a fantastic atmosphere."